1. Melt the butter in a frying pan over medium heat. 2. Add the chilli and fry, stirring for 1 minute. 3. Add the mustard seeds and cover the pan for 10 seconds, uncover and add the garlic. 4. Cook, stirring, until the garlic turns golden, about 1 minute. 5. 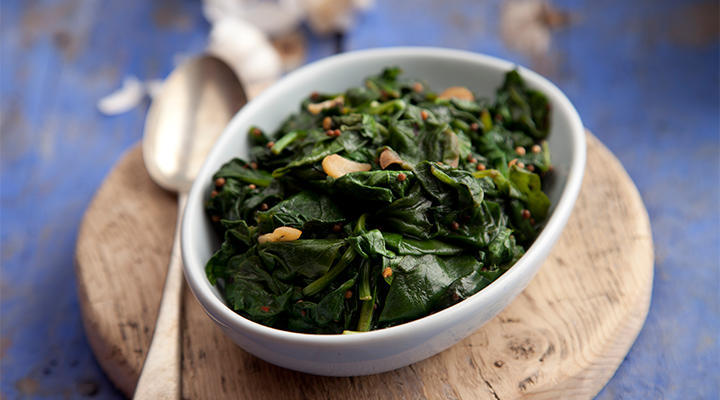 Add the spinach, a handful of leave at a time, and stir gently. 6. As soon as the spinach leaves wilt, add more. 7. When all of the spinach leaves have been added, stir well and add a pinch of salt. Cook for a further 5 minutes. 8. Adjust the seasonings with salt. Serve Immediately.